Blue Maid is considered one of the hardiest of its type. This broadleaf evergreen hybrid is fast growing and forms a shrubby broad pyramid shape. The leaves are leathery, lustrous dark green, almost blue-green, with slightly impressed veins. The Blue Maid Holly produces an abundance of dark red fruits.. It can be grown in sun to partial shade and prefers well-drained soil. Although it will grow 10 to 15 feet high, it can be pruned to maintain a desired size and shape. 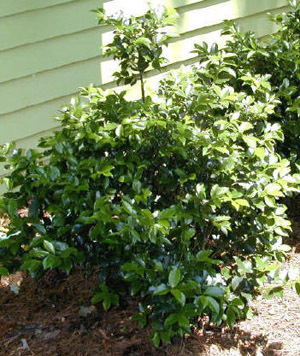 Blue Maid Holly is excellent used in a foundation planting, mass planting or shrub border.